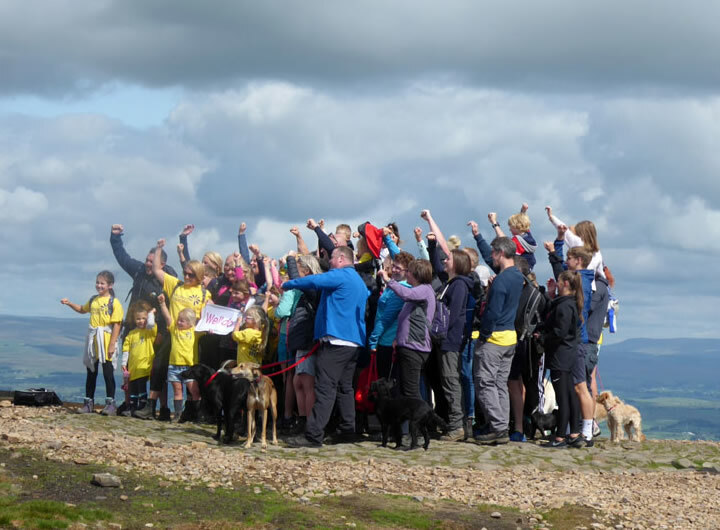 On 25th August I was invited to join Daisy for her 52nd ascent of Pendle Hill this year, a Herculean effort from a 4yr old to raise money for Pendleside Hospice. 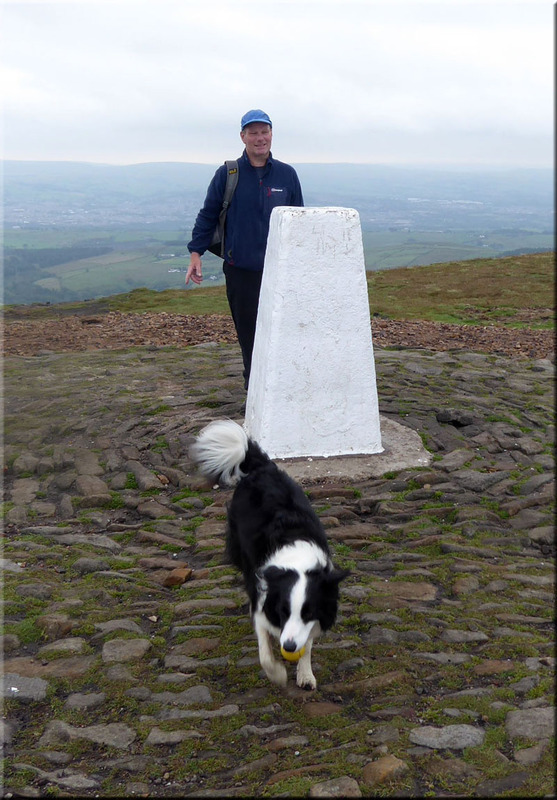 On my walks up Pendle with Molly, we had met Daisy, her dad and others on a few occasions. Above the frosty scene on March 4th and a dunnock on 25th March. 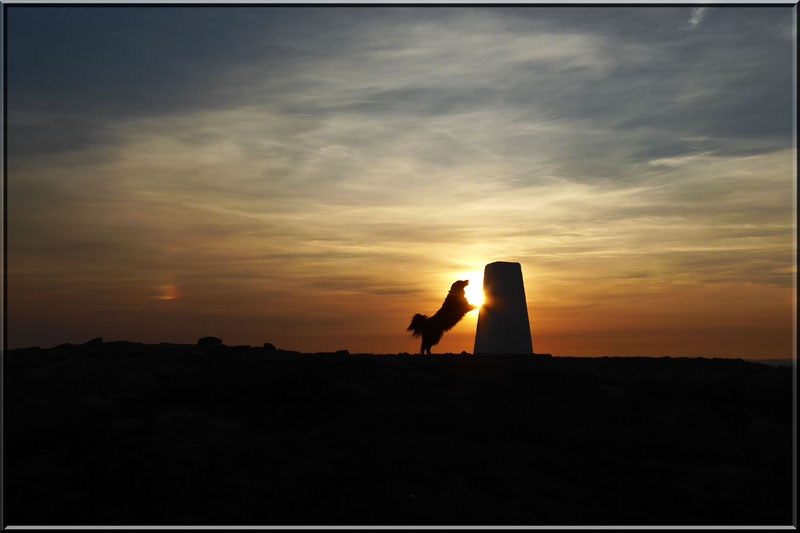 The stile has been a constant for many years and has provided additional content to "weather" photos, but for how much longer....changes are afoot. The charity walk was due to start at 11:00hrs, so Molly and I decided to go up earlier to make sure everything was in order. To my annoyance, a local Jack Russell-type hound decided to tag along. I've seen this one following other walkers on previous occasions. As dog owners, we are obliged to keep our charges under close control, how can this be acceptable? Top of my list of things I don't like on country walks is litter! But this type of litter is acceptable, if anyone recognises the note, tough I've spent it. On 5th May my cousin, husband and daughter Alice joined us for a hike up th'ill. 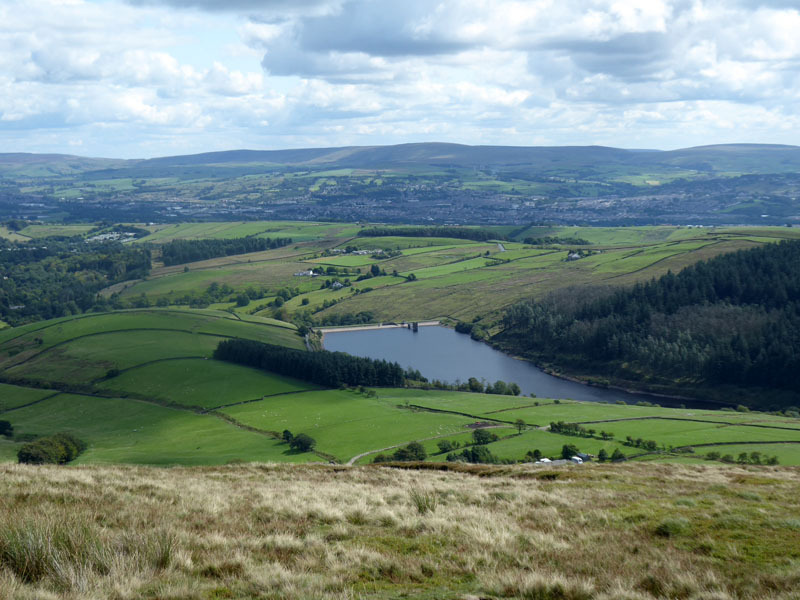 Wheatear are common Pendle during the summer months; dotterel less so, just passing on their journey north. 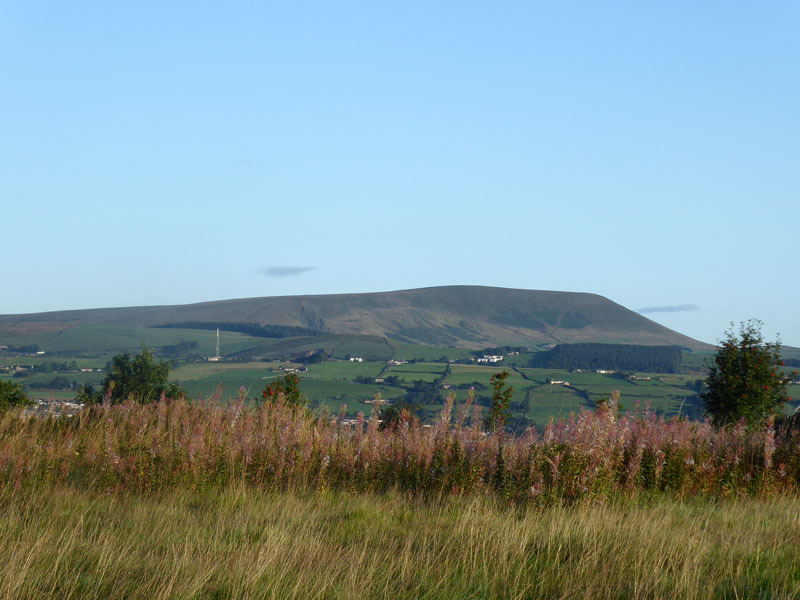 June arrives and the diggers have arrived to help with the "upgrading" of Pendle Hill as advertised last year. 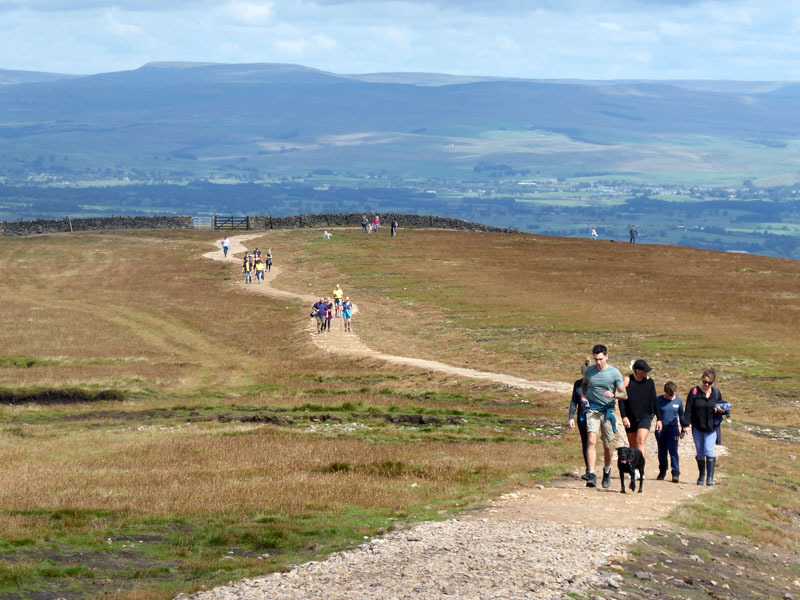 The paths will be improved and a shelter is planned, this should be interesting. Fledgling swallows appeal for food and by 14th July, Upper Ogden Reservoir is looking a little drained. All quiet on top at 09:10hrs and our little friend remains with us; Molly got a treat, the imposter didn't. 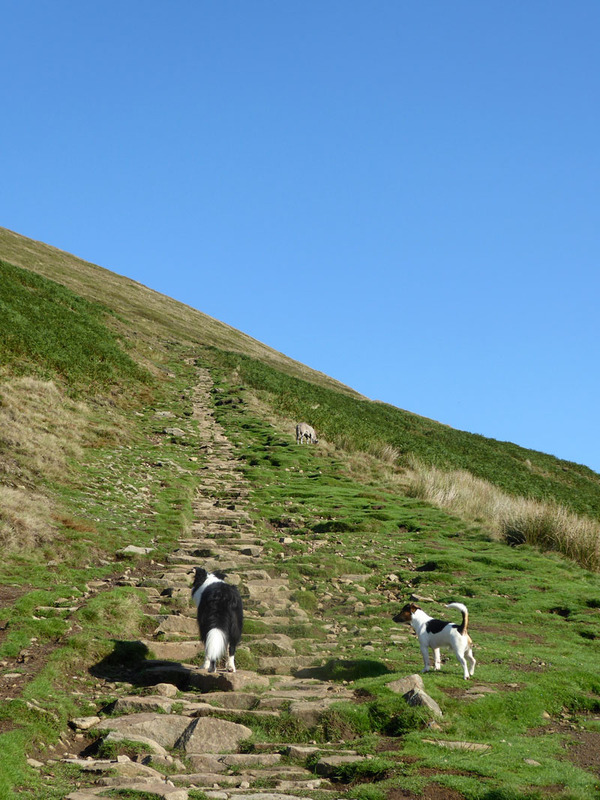 When we got to the foot of the hill, near Pendle Farm, the other dog wandered off. 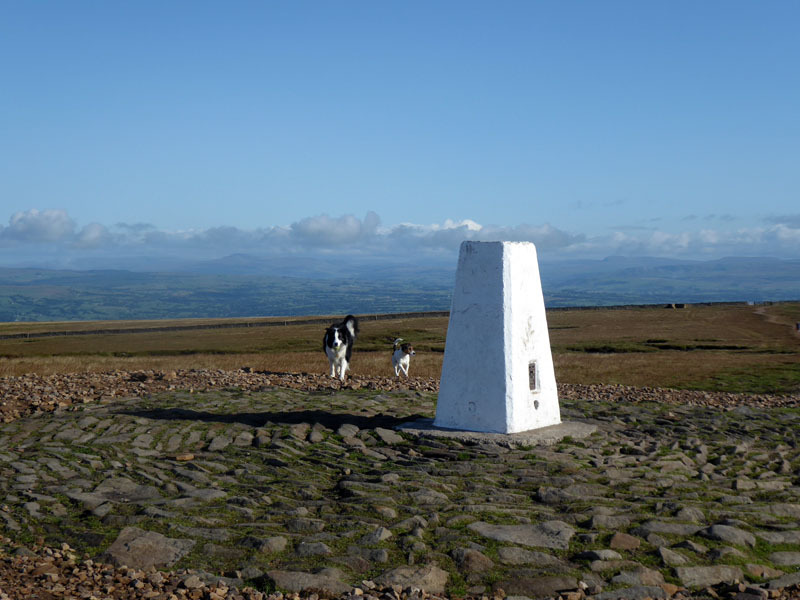 Molly bags her 250th ascent of Pendle without much fuss. Happy Hoopers make it look easy. No.500 for me since I started counting way back in 1994, a few prior to that and more than half since Molly dropped by. 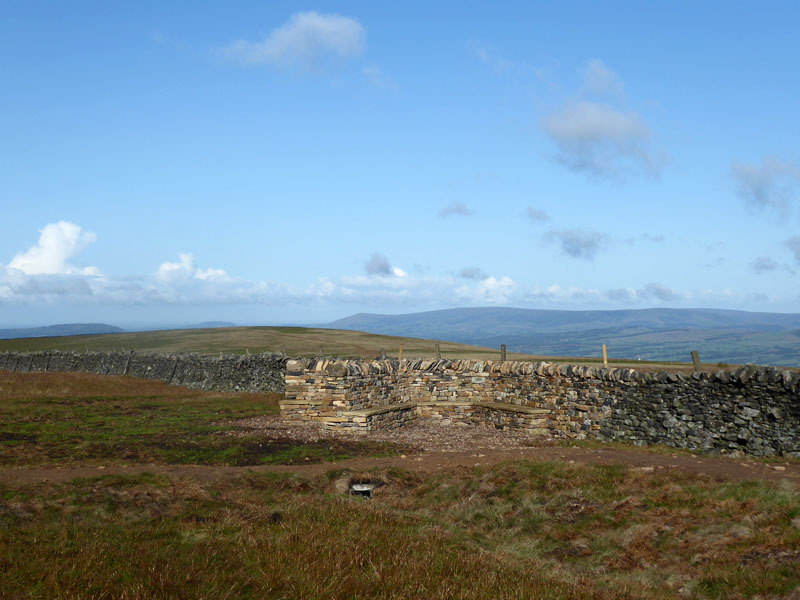 The new shelter has been very skillfully built into the wall with a stone stepped stile incorporated within. Shelter on all sides, but most seating thoughtfully situated away from prevailing westerlies. 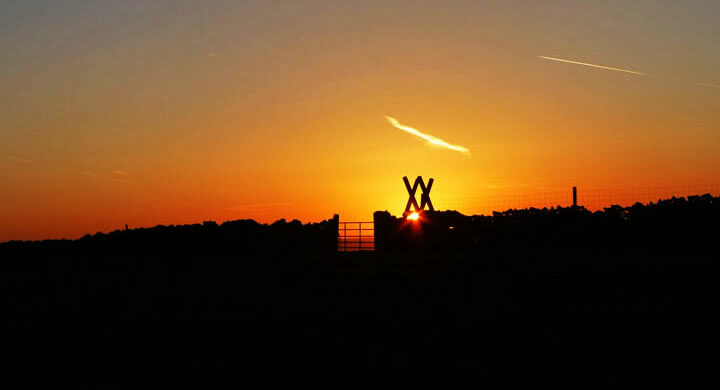 Where the old stile was, there is now a kissing gate and the farmers' gate remains. 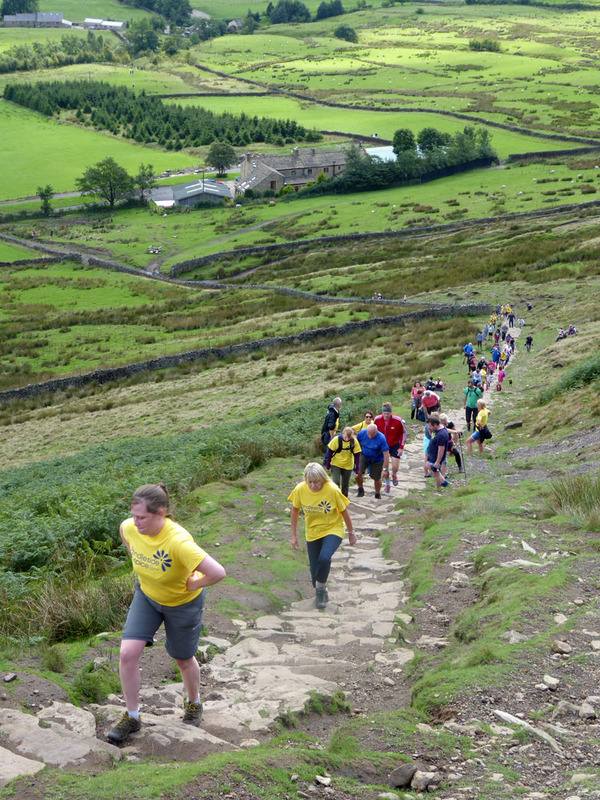 The charity walk started from Barley at a little past 11am and many of the participants are wearing Pendleside Hospice t-shirts. Maybe around 60 folk and quite a few dogs. Dog behaviour issues recurred, one was seen chasing sheep and the farmer was yelling from afar that he would shoot it. Nobody wins if that happens. I don't understand how owners allow this to happen. 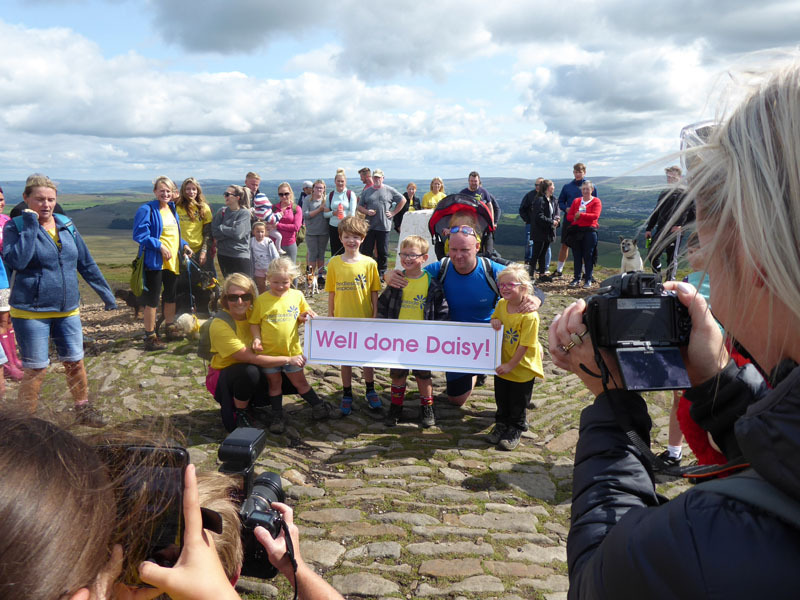 When I last looked, they had raised over £1,500 for the hospice, but maybe more than that Daisy has been an inspiration to many and I'm sure she will go on to achieve many other goals in her lifetime. Daisy is the little one on the left-hand side of the banner, as we look. Molly and I should have been in the main photo, but Molly was terrified by the crowd and cheers and we had to walk away, she had already made for the exit a few minutes earlier. Great day for it! Me and another walker, Ian, snook off and took a quiet route back to Barley.